An interesting sidelight on the statue was that many directors—in anticipation of its arrival—visualized something like a little fat cherub, perhaps with water spouting out of his mouth. When the bronze did arrive, abstract, austere, and perfectly stunning in its own way, it came as a shock. While it lay on its side in the courtyard waiting to be installed on the wall, children and adults asked why the junk pile was out there. After installation, the question was never asked again, because it clearly conveyed its message of the need of the child to separate from the mother, yet the wish to hold on. The statue depicts a parent–ageless, of indeterminate gender–in that moment between holding on to and letting go of a child, an act that repeats itself over and over again, during life. Mary Callery, the artist, captures this bittersweet, but ultimately life-affirming, act perfectly. 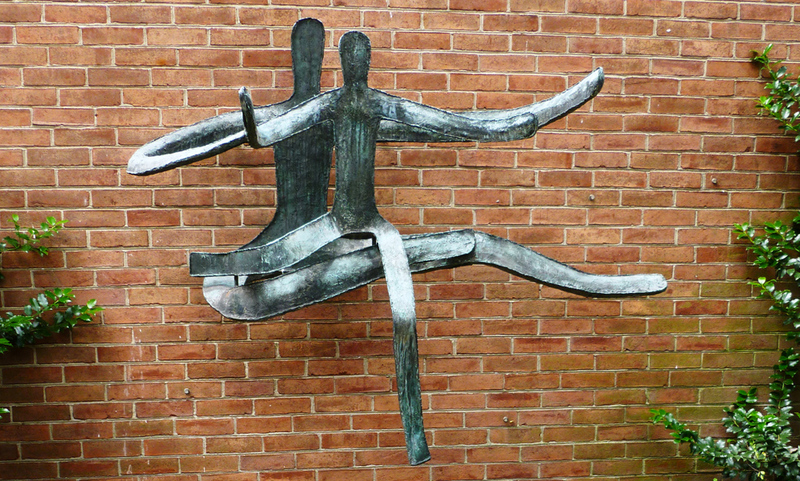 The sculpture has become a touchstone for everything that Laughlin Children’s Center embodies. Callery was born in New York in 1904 and raised by wealthy parents in Pittsburgh and Manhattan. In addition to being worldly, smart, and talented, she was fun. Callery lived in Europe for a time, eventually leaving a studio overlooking the Seine in wartime Paris as the Germans advanced and returning to New York. With her was an important collection of paintings: “more Picassos than anyone in America” was the word at the Museum of Modern Art. According to New York architect Wallace Harrison, Mary Callery was “the most elegant and beautiful woman he had ever met.” He remembered the vision of her “in a green dress, wearing an emerald the size of your fist.” Harrison later commissioned Callery for a sculpture above the proscenium of the new Metropolitan Opera in Lincoln Center. 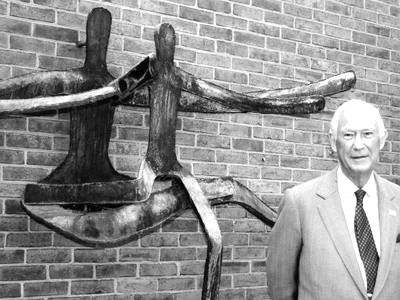 Mr. Laughlin also served as a trustee on the board of the National Gallery of Art for 14 years, the final three of which he served as chair. His keen eye for art brought the Center and “The Flying Lesson” together 54 years ago, and it’s been a perfect fit ever since.